Sometimes a stiff drink goes best with a good burger and a date. Other times it’s best accompanied by a great view. (OK, maybe bring along that date and burger, too.) In Las Vegas, there are so many places to grab a peek of the Strip: hotel lobbies, nightclubs, and even that observation wheel that’s definitely not a ferris wheel. Take your pick. Actually, check out the below, then take your pick. The Mandarin Oriental is a hotel that does things a bit differently. Instead of checking in on the ground floor, you take an elevator up to the 23rd floor to find the lobby as well as great restaurants like Twist and the Mandarin Bar, both of which offer a 180-degree view of the Strip from around the east end of the building. Another option: check out the nearby tea lounge for a different kind of drink-and-view experience. 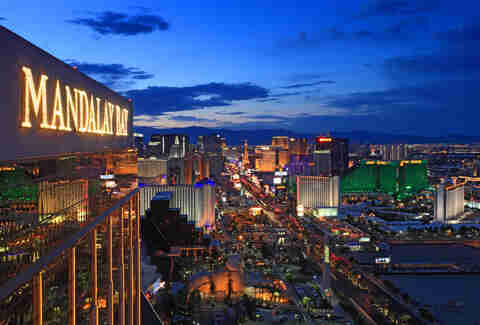 This spot has nothing to do with James Bond, but everything to do with checking out Sin City from the 64th floor. 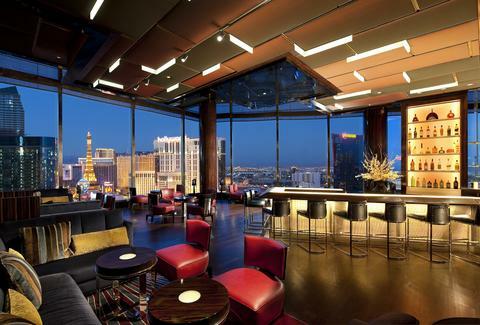 Formerly known as Mix Lounge, Skyfall overlooks the entire Strip from the south end. Look hard enough and you might spot a few bats flying around inside the spotlight of the Luxor pyramid next door. Along with a new name comes new renovations, including a vastly improved interior, an artisan cocktail program, and the neighboring Rivea restaurant. Most people like to hit up OMNIA for big name DJs like Calvin Harris and a moving chandelier that hangs over the dancefloor. 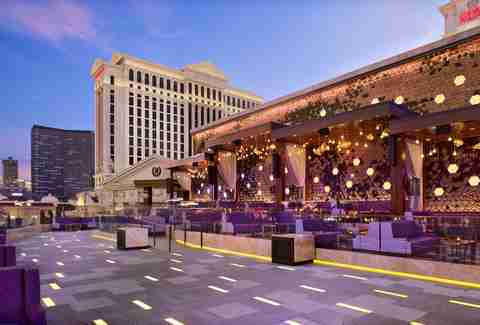 But the best thing about the nightclub is the open air terrace that comes with a perfect mid-level view of the Strip from Caesars Palace. 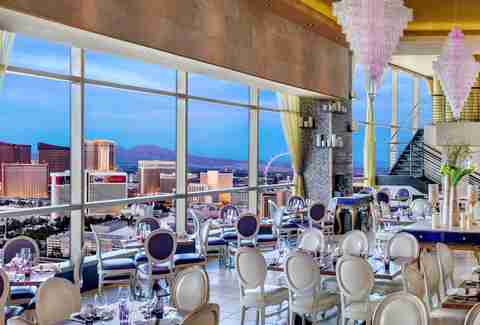 One of our favorite Italian restaurants in Vegas boasts sweeping views of the city from the 51st floor of The Palms' Fantasy Tower. But you don't have to book a table for dinner to take in the atmosphere; guests can enjoy the expansive wine and cocktail list, as well as nine dishes for $9 all night long at the bar. They include chicken pesto paninis and lemon crab bruschetta. 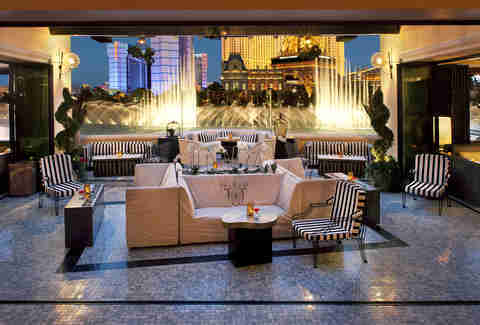 Once known as a private members-only club for high rollers, The Foundation Room has become a little more accessible these days, allowing the rest of us to enjoy the elegant yet rustic dining room and a cozy comfortable lounge that extends to an outdoor patio on the top floor of the Mandalay Bay resort. The view is spectacular and the next best thing to actually hanging off the side of the building. 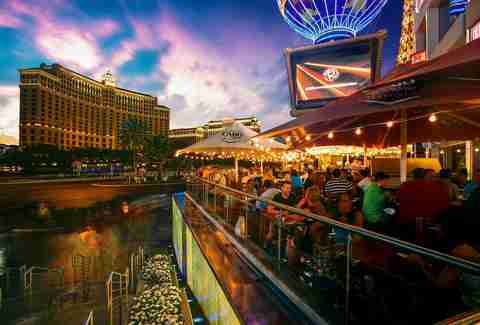 Slightly elevated above Las Vegas Blvd, the patio at Cabo Wabo is one of the best spots to check out the heart of the Strip just across the street from the Bellagio and nestled in between the Paris and Planet Hollywood. Dress casual and order a plate of nachos to go with your margarita (which, trust me, you're getting). 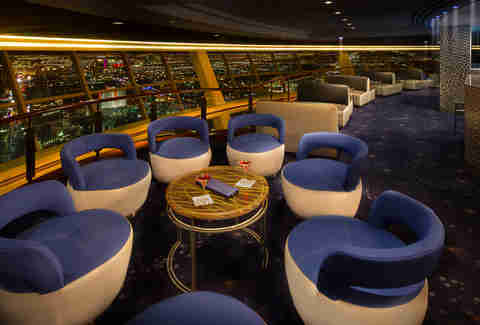 As the name suggests, 107 SkyLounge wraps around the 107th floor of the towering Stratosphere resort. 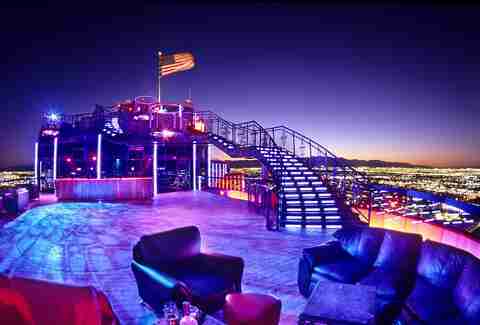 It's hard to find a higher vantage point to check out the lights of Las Vegas while enjoying some of the best dirty martinis in town and a surprisingly good deal on bottle service. Pay attention and you may even notice some helicopters hovering nearby. This brand new outdoor beer garden may be brought to you by Budweiser, but there are more than 100 beers to choose from on tap -- as well as wine and cocktails. It hangs off the side of the Paris resort and will keep you busy with games like giant Jenga and Connect Four. 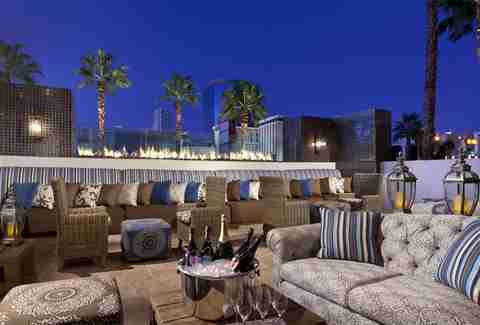 When the sun goes down, Chateau nightclub is right next door and offers an equally impressive view from the patio. 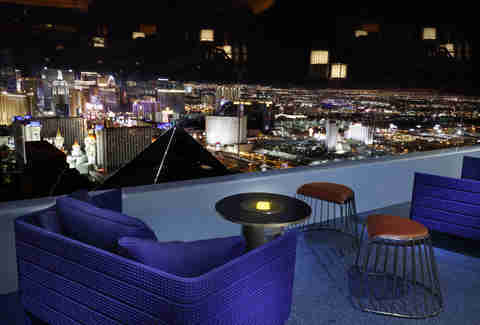 Just west of the Strip, Ghostbar offers a full view of Las Vegas in all its neon glory from the 55th floor of the Palms. Hang around inside and check things out through their 14ft-high windows or head outdoors where a see-through section of the floor puts everything into perspective. 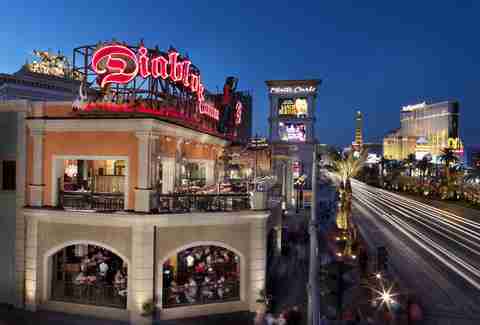 While only two stories above the Strip, Diablo's Cantina offers a massive outdoor patio that's one of the best places to be while watching people stumble around after a few too many. 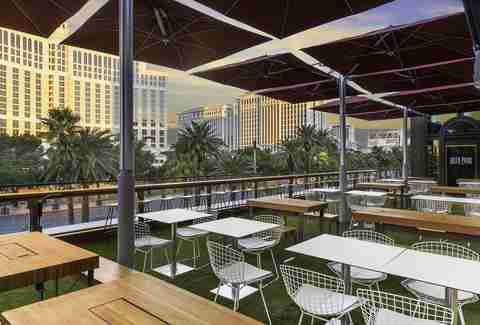 Expect the bar to get even busier after the new T-Mobile Arena opens soon right around the corner along with The Park outdoor entertainment and dining district. If you are going to take a ride on The LINQ Promenade's favorite tourist trap, you might as well book a cabin that comes with its own bartender. Order unlimited cocktails and see how many you can finish off during the roughly 30-40 minute ride on the world's tallest observation (don't call it a Ferris) wheel. 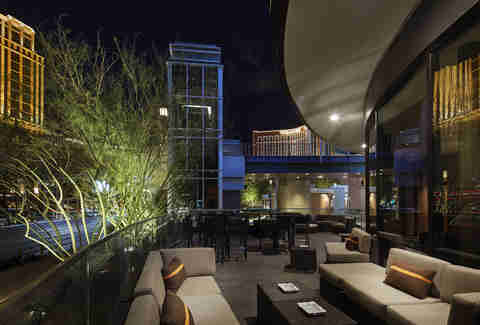 On the 51st floor of the Rio, you'll find not only the VooDoo Steakhouse, but also the VooDoo Lounge, which leads to an outdoor patio with a winding staircase to enjoy the view of Las Vegas from every possible angle. The bartender's favorite choice is usually the Witch Doctor, a rum cocktail topped off with smoldering dry ice and served in a giant fishbowl. One of the best kept secrets on the Strip, The Barrymore not only has great steaks and a diverse list of 50 wines for under $50, but also a bar and outdoor patio that includes views of the now-closed Riviera (which will be torn down soon) and the never-opened Fontainebleau (which should be torn down soon). It may sound depressing, but it's actually a welcome escape from more chaotic areas of Las Vegas and an opportunity to reflect on the evolving north end of the Strip, which will likely look a lot different in just a few years. Rob Kachelriess is still saving up to buy a membership at the Foundation Room. Follow him on Twitter @rkachelriess.